Student IMPACT is a ministry that allows teen disciples to lead their peers and others to Meet Christ, Know Christ, Love Christ, and Serve Christ. Teens can get involved in a number of different ministries in different capacities that fit their leadership style. Teens help plan and run EDGE nights for our middle school students while also serving as small group leaders. Responsibilities include attending EDGE nights and a monthly planning meeting. Teens are able to join us and help lead retreat experiences for middle school students. Teens take a leadership role in planning, promoting, and running Life Teen Club for their high school peers. Teens help our adult core team plan, promote, and run IGNITE for their high school peers. Teens also get to help small group leaders during small group discussions. Responsibilities include attending IGNITE and a monthly planning meeting. 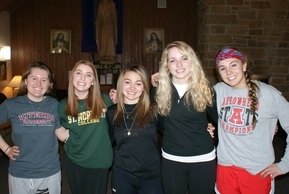 Teens also can attend retreats as peer leaders. Teens wishing to share their musical talents are encouraged to do so as part of our high school praise group. This group leads us in praise and worship for EDGE, IGNITE!, retreats, and varies other Life Teen Events. Teens can help the parish worship better by signing up for a liturgical ministry. Teens involved in these ministries must attend training days and be on the regular liturgical schedule. This includes finding subs when necessary. Liturgical Ministries Include: Lector, Server, Eucharistic Minister, and Greeter/Usher. Members of Student IMPACT should be living their life as a disciple by continuing to be involved in a Life Group and Loving Christ through service events. Confirmed Seniors involved in either the EDGE or IGNITE Core Team and/or the High School Praise Group also have the ability to assist as peer leaders on our confirmation retreats.